Masai Ujiri is leaving Denver to take over the basketball operations for the Toronto Raptors. The Raptors announced in a press release on Friday the NBA's executive of the year has agreed to a deal with Toronto. From the moment he took over the moribund Toronto Raptors last month, Tim Leiweke vowed to make some significant changes to return the team to competitiveness in the Eastern Conference. It didn't take him long to show everyone that he means business. Leiweke lured Masai Ujiri away from the Denver Nuggets on Friday, giving the Raptors the reigning NBA executive of the year and a rising star among the league's front office ranks. "We feel very lucky to have Masai in our organization," Leiweke said in a statement issued by the team. "He is a proven judge of talent and we look for him to be a big part of creating a winning atmosphere, leading us to the playoffs and, ultimately, delivering NBA championships for Toronto." Reports suggested the contract could be worth up to five years and as much as $15 million US, but the team did not confirm the terms. 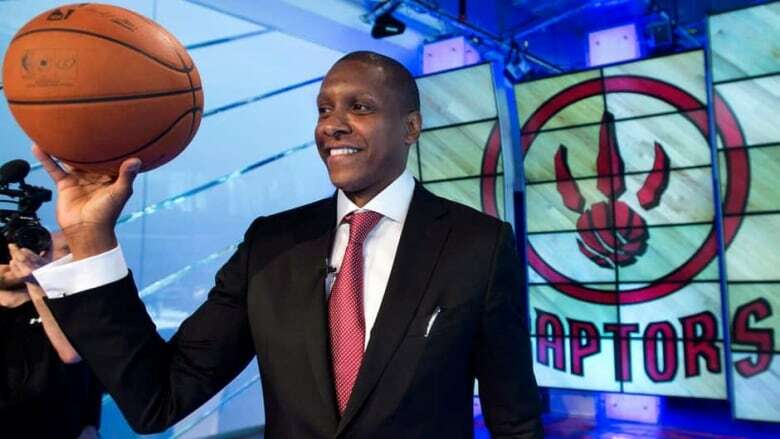 It will be a homecoming of sorts for the 42-year-old Ujiri, a native of Nigeria and the first African-born GM in America's four major sports. Ujiri was the assistant GM for the Raptors for three seasons before leaving for the Nuggets in 2010, where he quickly made a name for himself. "To come back to the Raptors, to live in such a great city, and work in an organization that has committed all the resources necessary to win championships was a huge factor in the decision," Ujiri said in a statement. "I have already developed a great relationship with Tim Leiweke and I can't wait to get back to Canada to build a team that is poised to take the next step in the NBA." Ujiri will have some weighty decisions to make soon after taking the helm in Toronto. With the team currently over the league's luxury tax threshold, he will have to decide which of the Raptors' burdensome salaries to eliminate using the amnesty clause. Another pressing concern is finding a willing trade partner for maligned Italian forward Andrea Bargnani, whose welcome in Toronto has long been worn out. But Ujiri has had success with tricky manoeuvring in the past. He earned respect for his deft handling of the Carmelo Anthony trade to New York and his ability to assemble a relatively starless roster that still managed to be a formidable contender in the Western Conference. With nary an all-star this season, the Nuggets won a franchise-record 57 games and went an NBA-best 38-3 at home to finish third in the powerful Western Conference, helping Ujiri garner the NBA's Executive of the Year honour to go with George Karl's Coach of the Year award. But Ujiri was also one of the lowest-paid GMs in the league, earning less than $1 million US a season, a salary commensurate with the Nuggets' reputation for paying their front office members below market value. Team president Josh Kroenke told The Denver Post a week ago that he and Ujiri had agreed in principle to a contract extension, but once the Raptors came calling, he felt obliged to let Ujiri interview with his old team. "I would also like to publicly thank the Kroenkes in Denver for being such a class organization that they would allow Masai to pursue his dream," Leiweke said. "They put him first in all of our discussions." Kroenke worked closely with Ujiri to shape the roster and he could turn to Pete D'Allesandro, Ujiri's right-hand man in Denver, to take his boss' place. D'Allesandro also could follow Ujiri to Toronto. "I appreciate everything Masai has done since re-joining the Nuggets in 2010," Kroenke said. "Over the past two and a half years, he and I have spent countless hours working together to tackle some of the toughest challenges in franchise history. "I have tremendous admiration for him as a colleague and will always consider him to be a great friend. The potential for awkwardness exists in Toronto where Bryan Colangelo, Ujiri's former boss with the Raptors, was recently stripped of final say on basketball matters. Leiweke was looking for a new voice to lead the franchise that has missed the playoffs for five straight years. "There is accountability here and we need a new set of eyes and a new thinking," Leiweke said last week. But Colangelo's contract was extended and he was moved into a new role as team president, something that he admitted made him "a little disappointed." Ujiri will report to Leiweke and have complete authority on basketball matters. "Bryan's probably ticked off at me," Leiweke said then. "There's no probably. He's ticked off at me. This isn't his perfect world, either. But to his credit, he accepts it." But Ujiri has plenty of experience navigating difficult situations. He took over as GM in Denver on Aug. 27, 2010, where he was handed the Melo-drama with Anthony demanding a trade to the New York Knicks. After finally engineering the blockbuster deal that next February, Ujiri famously apologized, saying, "We feel we got killed in the trade." But it turned out to be a win-win for both teams: Denver landed a bevy of young players, trade exemptions and draft picks Ujiri used to retool the roster, and the Knicks got a bona fide superstar to build a team around. Danilo Gallinari came over in the deal along with fellow starter Kosta Koufos, key reserve Wilson Chandler and emergency centre Timofey Mozgov. The Nuggets also got Raymond Felton, whom they flipped for point guard Andre Miller and two draft picks, one of which landed them Jordan Hamilton. They used trade exemptions from the deal to acquire Corey Brewer from Dallas and JaVale McGee from Washington. A first-round draft pick acquired in the trade was used to get starter Andre Iguodala from Philadelphia last summer, and Denver used a second-round pick from the deal to draft Quincy Miller. That's 10 Nuggets connected to Anthony's departure from Denver. Last year, he drafted Evan Fournier of France and Izzet Turkyilmaz from Turkey and also earned praise for drafting Kenneth Faried with the 22nd pick in 2011. "It was a very difficult decision to leave Denver, but the Nuggets remain in good hands," Ujiri said. "I'd also like to thank the coaching staff for their work and the fans for their support and dedication. I'll always have a special place in my heart for the city of Denver and the Nuggets as an organization."